If you hadn’t yet had a chance to check out the MobileMe Calendar beta, which first launched back in July, don’t fret: as of Thursday, it’s available to all MobileMe subscribers. The highlight of the new Calendar, besides a streamlined and updated Web interface reminiscent of the iPad’s Calendar app, is a bigger emphasis on sharing. Rather than iCal on your Mac being the center of your scheduling world, your calendar data now lives on MobileMe’s servers, with the data synced to your iPhone, iPod touch, iPad, Mac, or PC. MobileMe users with iOS 4 devices will even get updates pushed directly to their phone without having to manually do anything. Another big improvement in the new MobileMe Calendar is the ability to send e-mail invitations to anybody, regardless of whether or not they are a MobileMe member: they can mark their attendance just by clicking a link in the message. In addition, the new Calendar system makes it easier for you to share calendars with other MobileMe members, even allowing multiple MobileMe users to edit the same calendar. You can also publish a read-only calendar with access for Google Calendar, iCal, and Outlook users. 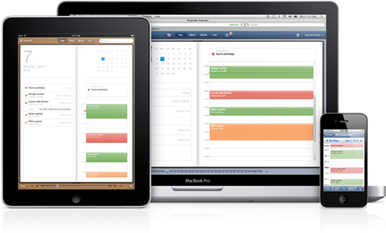 Before you upgrade to the new Calendar, check that your system meets the requirements: Mac users need Mac OS X 10.6.4 or later, while Windows folks will need MobileMe Control Panel version 1.6.3 and Outlook 2007 or 2010. iPhone or iPod touch users should be running iOS 4.1 while the iPad’s iOS 3.2 should be compatible, except for push calendar updates, which will arrive with iOS 4.2 in November. Users who were already beta testing MobileMe Calendar need do nothing—they’ll be automatically ushered into the final release version. Other subscribers should visit MobileMe’s Calendar Web app and click “Upgrade now.” Apple also provides help for setting up the new MobileMe Calendar and setting up iCal to work with it.